The announcement of the NBA 2K league was huge—17 NBA teams will be investing in esports teams which will be contracted to compete in a regular season running concurrent with the NBA season. It was enough to pique many people’s curiosity, including our own, but when we went looking for references to any existing 2K esports scene, we came up with more questions than answers. Sports games have had their own share of the esports scene for a while. FIFA has a fair share of followers, as does the Madden series, to say nothing of Rocket League’s success in the competitive realm. But cursory searches for any mention of an NBA 2K competitive scene continuously come up with little to nothing outside mentions of the upcoming 2K eLeague itself. This isn’t to say that 2K has no community whatsoever, of course. Tons of people play it, and plenty of YouTube channels thrive on 2K content, whether comedic or high-level gameplay. But the league is promising a 17-team landscape in which players create their own avatars to fill out five-player squads. That’s 85 players total, and there doesn’t appear to be supply to meet that demand. What tournaments we did find were small, community-hosted events, and those tend to be the most promising. Though view counts vary from the low hundreds to a few thousand, the video creators on YouTube seem to be the ones most prominent in the scene, propping up tournaments like the 2K17 Pro-Am Championship, so it’s disappointing to see little to no mention of them in the league announcement. Where competition for NBA 2K seems to thrives is at the grassroots level, where local tournaments form followings among both casual and semi-pro players. Though 2K lacks in formal tournaments, it’s not hard to find a local group willing to play. It’s a scene that could, given time and attention, thrive, and develop players more interesting than the actual, say, Knicks. Those creators and players are the ones who can get a community interested in the game in question. On the other hand, stats like NBA 2K17’s Twitch average viewership paint the NBA 2K series as the distant third in the sports-esports pantheon behind FIFA and Madden, garnering 3000 viewers at the most compared to tens of thousands for the others. Though individual YouTube channels thrive, the Twitch audience is often a good metric for esports followings, and right now 2K lacks in that department. The most publisher 2K can point to is their own NBA 2K17 All-Star Tournament Championship, a showmatch put on by the company and featuring two teams, Still Trill and Throwdown. Put on the same week as the NBA All-Star match, it was a highly produced presentation, but still a showmatch only featuring two teams. It’s entirely possible that 17 NBA teams just formed a league for a scene that might not be prepared to meet the demand. There doesn’t seem to be 85 professional or even semi-professional players ready to take up for the game. Lack of a prominent tournament scene means there’s been little incentive for teams to form or stay together, and most of the community seems more interested in personalities than the hardline-competitive angle of an esports league. All of this also, though, has to do with hype—with corporations worth billions of dollars trying to direct the spotlight onto something they can control and own. 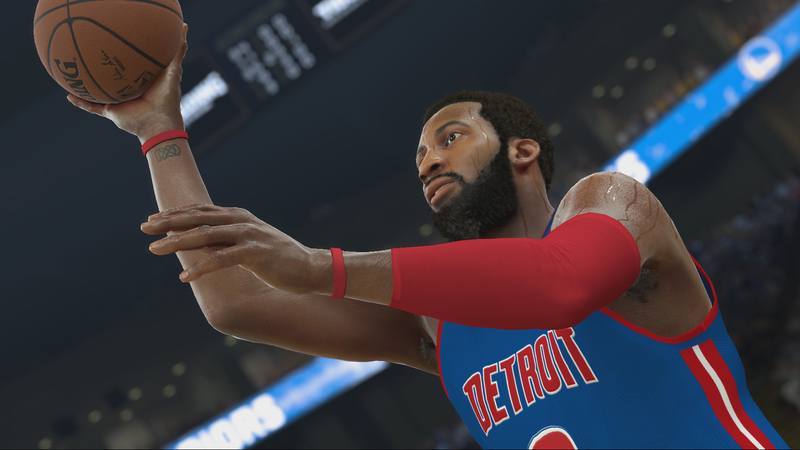 From the outside looking in, the NBA and 2K are taking the scene from zero to 100, without ensuring there’s enough genuine support among fans or even players to meet their demand. Why? Go back to that point about controlling and owning. It’s perfectly possible that I’ll be sitting here a year from now eating copious amounts of crow as NBA 2K’s league flourishes. But that it takes a ton of digging to find any competitive scene, tape, or teams doesn’t bode well for one of the largest esports investments yet.